The big red Helvetica fonts known as the RI Welcome Monument/Icon/Sign. Southtown resident Janet Falk is a communications professional with a solid track record. Lending her expertise, she wrote to RIOC President/CEO Susan Rosenthal and Public Information Officer Alonza Robertson, "At the ceremony for the new RI sculpture, you asked for feedback on the sculpture. Here are my thoughts." She, then, unpacked them, one at a time. 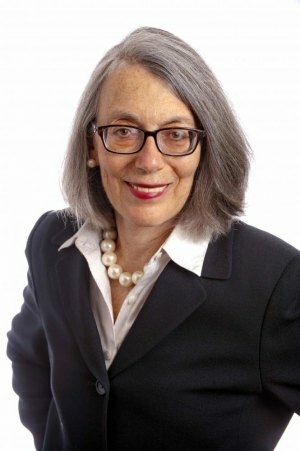 Janet Falk, Falk Communications & Research, Southtown resident. "With any worthwhile project, you ideally start with the goal, then work to achieve it," she began. 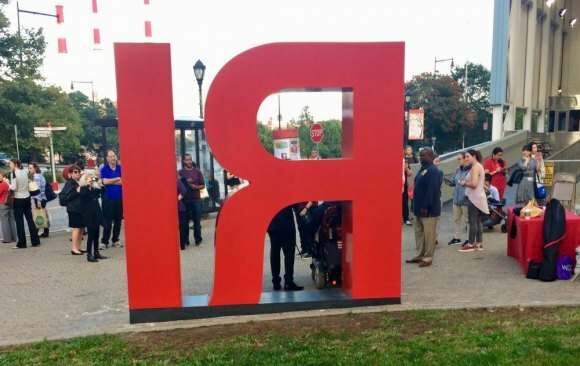 "If RIOC’s stated goal is to welcome visitors and have people take photos of Roosevelt Island, then the merit of the RI sculpture is unfortunately low, because the goal is not worthy of an investment of $130,000." This restates what's been obvious from the beginning to many Roosevelt Islanders. The Welcome sign, previously holding the titles of "icon" and "monument" is about as creative as slipping on a bar of soap. Did the combined braintrust at RIOC and Hudson-Related really think 8-foot expressions of the world's most ubiquitous font would bring visitors scurrying across the East River for a photo op? 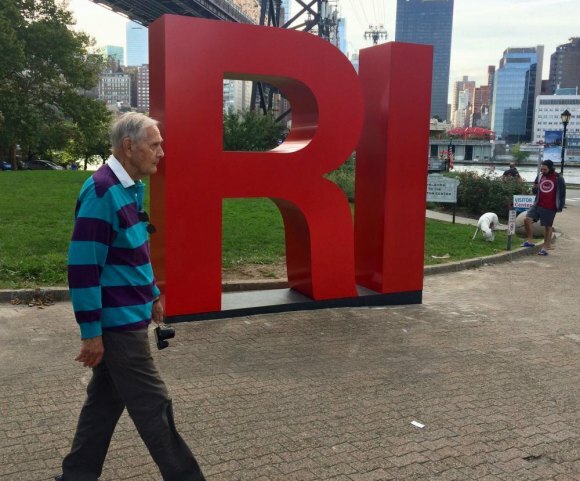 "If RIOC’s goal is to attract tourists to Roosevelt Island and when they arrive, they take a photo, notice the directional signage, explore the Island and spend a few dollars in the local restaurants and shops, then the RI sculpture is inadequate." A wayfinding sign and nearby kiosk are woefully inadequate as information vehicles for sending visitors north on Main Street. For what? "With a focus on welcoming visitors, RIOC apparently has no goal for the RI sculpture to benefit the residents and local businesses, which makes the RI sculpture a failure." She adds, "How will tourists even know there is a Roosevelt Island when RIOC does not promote it as a destination? Not sure what this is supposed to be, but it's the most common viewing angle. "As I have noted in the past, when visitors arrive at Tram Plaza on the Manhattan side, they have no way of learning there are eight restaurants, an art gallery and spectacular views of the Manhattan skyline when they arrive on Roosevelt Island. No wonder they land and immediately re-board the tram," she said before telling as story. "Recently, before the directional signs were erected, I saw a tourist with two teenagers standing by Firefighters Field, staring at her phone. I asked if she needed information. Upon hearing that she wanted a coffee, I directed her to a local restaurant. There was nowhere for her to learn that location." "Even with the directional signs, there is no indication where a restaurant is located. The catchy phrase Shops on Main does not convey that there are food establishments there." What amazes most of all is that, with months to consider and plan, RIOC and Hudson-Related came up with such a flawed plan. Part of that is certainly due to the well established practice of RIOC failing to engage with the community for input. 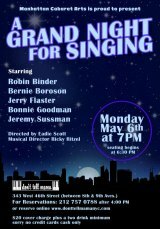 Falk concludes ruefully, "The Roosevelt island Residents Association voted a resolution against the sculpture, yet RIOC proceeded with its cockamamie plan." On Monday, The Daily will report on our month long survey, The RI Welcome Sign: Yes or No. Hudson Partner David Kramer promised RIOC's Real Estate Development Subcommittee that, if residents decide they don't like the sign, he'll remove it, perhaps to a new location. Critics are doubtful he'll keep his word, if that condition is met, although RIOC's Board has the final say.